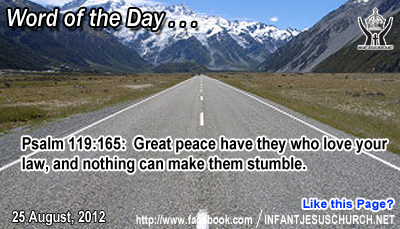 Psalm 119:165: Great peace have they who love your law, and nothing can make them stumble. Heavenly Father, Thank you that we don't have to face today or tomorrow with doubts about our basic values and without a sense of your will for our life. Awaken in us a love for your will and your word so that nothing can make us stumble. Empower us with your Spirit and guide us by your truth so that we may more perfectly meditate your character. In Infant Jesus' name we thank you for listening our prayer. Amen. Respect for God and his ways predispose us to Godly humbleness and simplicity of heart. The word disciple means one who pays attention in order to learn. Jesus shows us the way to the Father – the way of peace, joy, morality, holiness, and true happiness. He demonstrated us the way by humbling himself as a servant for our sake. He lowered himself, even to death on a cross, that we might be raised up and exalted at the Father's right hand in heaven. What is true Christ-like humbleness? Humility is true self-knowledge concerning oneself as God sees each of us. The humble do not rely on themselves, but faith in God and in the power of his love and saving blessings. True humbleness is a servant-like quality which enables us to place our life at the service of God and the service of our fellow citizen. Do we know the joy of Christ-like humbleness and simplicity of heart?